Beautiful, sunny and bright north-east facing apartment that has been meticulously furnished and is a short walk to the Exhibition Buildings, casino, city, DFO outlets, market, Etihad Stadium and more. Three spacious bedrooms that can sleep up to 8 people with an open plan kitchen, dining and living area that also opens out onto an entertainers balcony overlooking Melbourne's Crown Casino and city skyline. This apartment best suits families and groups of adults over 24yrs. Children are welcome. Onsite parking available. NOTE: we have another 2 bedroom apt in the same building if you need two apts for larger groups. 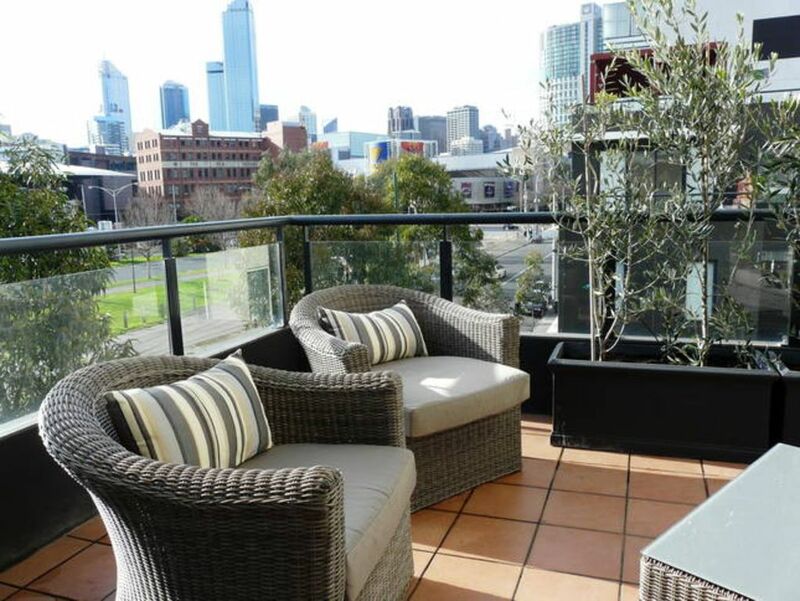 Rivergarden Apartment is located diagonally opposite the Crown Casino with fabulous views of the city skyline. The tram line runs across the road which will take you either to St Kilda or into the centre of the CBD. It is only a couple of minutes walk to all that Southbank has to offer - restaurants, cafes, shopping, casino, exhibition building, conference centre, DFO outlets and major train stations. Walk along the beautiful Yarra River to the botanical gardens, art centre etc. You can also walk or jump on the tram to South Melbourne with it's fabulous shopping centre and cafes or the famous South Melbourne Market. Albert Park is also a short tram ride with beautiful walks around the lake, playgrounds for the children and of course the famous MSAC swimming complex with indoor and outdoor pools, huge waterslides and wave pools. The apartment building itself also has it's own swimming pool, gymnasium, tennis court and beautiful outdoor BBQ area. Inside the apartment the configuration consists of a main bedroom with a king sized bed, second bedroom with two single beds and a large 3rd bedroom which has bunks with a double bed on the bottom and a single on the top and a daybed. We do have a portacot available for hire as well as a highchair, and loads of toys, books and movies for the young ones. There is a fully equipped kitchen with dining area and a comfortable lounge area with a 50" flat screen tv opening out onto an entertainers balcony with outdoor armchairs to relax and read the paper while taking in Melbourne's skyline. Central bathroom with shower, bath, washing machine and dryer. PLEASE NOTE - There are no hand-rails in the bathroom or bedrooms. January - Summer holiday rates - pls check on calendar or with owner. Monthly bookings - $250 per night. Guests over 6 incur a $25 nightly charge per guest. Bookings over 7 days receive complimentary carspace. Under 7 days the fee is $15 per day for secure on-site parking. NOT AVAILABLE FOR END OF SCHOOL CELEBRATIONS. Views over Melbourne's Crown Casino complex as well as Southbank and Melbourne's CBD. Sunny and bright with north facing aspect. The shower is over a bath which would make it unsuitable for a wheelchair. Great apartment! And great owner! Key to open Car parking garage wasn’t working so have to put deferent battery . But other wise great stay! Thanks Yoko, glad you enjoyed it and thanks for letting us know the carpark garage door was getting slow at opening, will definitely change the battery tomorrow! Great apartment that suited 5 ladies well for our getaway! Thanks Rosemary, so glad to hear you had a fun girls weekend away! Thanks for staying and we hope you can come again someday! Thanks Jason, you were pretty unlucky with the 40 degree heatwave! We have just put in some new fans though which will make a big difference when the temps hit those levels for a few days in a row. Fantastic property in a good location. Would have given 5 stars if the second bathroom was available. 6 people sharing one bathroom was not ideal. well equipped, spacious, comfortable beds and seating, loved the little extras like herbal teas etc, great balcony, will be back here. Stayed here during conference at exhibition centre. Was prefect for our team. Had everything we needed was very comfortable and only a few minutes walk from the exhibition centre. Thanks Kelly, really glad it suited your team, it is a great spot and is always good to not have to rely on transport. Hope you had a successful conference and remember us for next time. We do have other properties as well in that building and others nearby of varying sizes depending on how many in your group. All the best! The Rivergarden Building is located behind the Exhibition Buildings and with the Casino and Crown complex just across the road. 5 min walk to the Yarra River with all the restaurants and bars along Southbank. Another 10 mins and you will find yourself at the National Art Gallery with the Botanical Gardens across the road. Another 10 minutes meandering past the rowing clubs and under the trees will take you to the sporting area comprising Rod Laver Arena with AAMI Stadium across the road and the MCG behind. 5 mins the other way and you have a huge DFO center. Tram line out the front of the building to take you into the centre of the city in 15 mins or the other way to St Kilda Beach. Great location in a spacious, well-priced,family-friendly apartment with views over the city.